Supernova remnants - Solar System Planets And Moons Section. 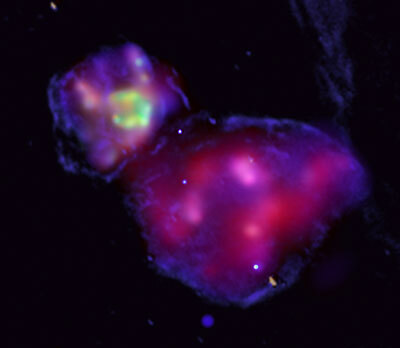 Chandra X-Ray Observatory, contains not one, but two supernova remnants. Nov 15, 2005 This unique photograph, taken by NASA's Chandra X-Ray Observatory, contains not one, but two supernova remnants. The pair are known as DEM L316, and they're located in the Large Magellanic Cloud galaxy. The gas shell at the upper-left contains considerably much more iron, so it's probably the product of a Type 1a, triggered by the infall of matter from a companion star onto a white dwarf. The lower-right shell is a Type II supernova, the remains of a massive star that exploded a few million years into its short life. Spotlight on the Cassini Division. Nov 15, 2005 In this face-on view of Saturn's rings, the darker Cassini Division is clearly visible. On the left is Saturn's massive B ring, which is has its edge maintained by Mimas, one of its moons. This photograph was taken on May 18, 2005, when Cassini was approximately 1.6 million km (1 million miles) from Saturn. NASA Ames Leads New Robotic Moon Missions. Nov 15, 2005 NASA has announced that its Ames Research Center will manage the agency's new Robotic Lunar Exploration Program. Before humans set foot on the Moon again, a fleet of robots will map the lunar surface in tremendous detail. NASA Ames has already sent robots to the Moon; most recently the Lunar Prospector, which was launched on January 6, 1998. The spacecraft orbited the Moon, and found evidence of water ice at its poles. Spitzer Sees a Group of Baby Stars. Nov 15, 2005 Star-forming region NGC 1333 is located 1,000 light-years away in the constellation Perseus, and is normally enshrouded by thick dust. NASA's Spitzer space telescope used its Infrared capabilities to pierce this dust layer to reveal the young stars hidden inside. Astronomers are hoping to use Spitzer to spot any nascent planetary structures around these young stars. Now that they're getting going, the young stars are firing out jets of radiation that are steadily clearing the surrounding region of additional dust.